If it talks like a duck and it walks like a duck and it looks like a duck, then it’s a duck. And what is a climate alarm duck? A climate alarm duck has one very identifiable feature, in fact it has a single feature which distinguishes it from all other species of duck: It needs the radiative greenhouse effect to live. Climate alarm is based on a single fundamental postulate: that the atmosphere behaves in some way analogously to a physical greenhouse building, and produces a radiative greenhouse effect, where a cold atmosphere makes a warmer surface warmer instead of cooler. The alarmist movement just calls it a “greenhouse effect” without making the distinction that it is a radiative greenhouse effect, not a physical greenhouse effect. There is definitely one type of person who gets very upset when the climate alarm radiative greenhouse effect is questioned, and that person is of course a committed alarmist. The other type of person is a person who appears to be skeptic or scientist, but doesn’t behave like a skeptic or scientist when it comes to questioning the climate alarm radiative greenhouse effect; in this interesting case, they behave just like an alarmist. It is quite a curious thing. So I got put onto an email thread referencing this post at PSI. The following all occurred at that time, around a year and a half ago by now. Apparently it made Mr. Christopher Monckton very upset that someone would publish an article with a title that implied that a scientist that he knew would agree with PSI. So the article at PSI was then making the point that if climate sensitivity (CS) is actually indistinguishable from zero, then ipso-facto one has to reconsider the radiative greenhouse effect which is the singular basis of climate alarm, because CS can’t be zero (or close to it) if there is indeed a radiative greenhouse effect. Dear Mr O’Sullivan, – You are not, repeat not, to suggest in future that Dr Singer in any way endorses the unscientific superstition to which “Principia” “Scientific” adheres. Like all true scientists, Fred – whom I have contacted – accepts, as any scientist must, that the measured and well established greenhouse effect exists, and that, all other things being equal, our returning to the atmosphere some of the CO2 that was formerly there will be likely to cause some warming. The question in the scientific debate is not whether CO2 will cause some warming – it will: get over it – but whether it will cause very much warming, and whether the warming it causes will be harmful, and whether the cost of attempting to prevent the warming would be greater than permitting it and adapting to it. Dr Singer has remained constant in this position throughout, and you are not in future, on pain of legal action, to attempt any further your characteristically dishonest attempts to suggest that you have somehow persuaded him of anything, let alone of the abandonment of science. Fourier and de Saussure, long ago, demonstrated that this supposed mechanism of this diagram does not exist, and any modern analysis free from the contamination of climate pseudoscience sophistry likewise continues to demonstrate that fact. That above diagram establishes the basis ontology, the metaparadigm, of climate science and its alarm. One can test for the mechanism of this diagram empirically, and one can analyze it via theory and logical analysis, and it does not stand. Radiation does not behave within the atmosphere as some sort of a pressure valve leading to higher temperature. The scale of the pseudoscience of this climate fraud, the scale of the lie, is too much for some to comprehend. Get over it…science makes mistakes and then progresses. Radiation from a cooler source does not send heat back to a warmer source, and neither does radiation from a cooler source act like some sort of a pressure valve which radiation from a warmer source must overcome by its source becoming warmer still. It is that diagram above which proposes those ideas, it is those ideas at the basis of climate alarm and climate science as a field, those ideas are called the radiative greenhouse effect, [and they are contradictory to thermodynamics and heat energy flow] and Fourier and de Saussure demonstrated long ago already that those ideas are wrong, that they do not occur, and any empirical test will continue to demonstrate that since nature hasn’t changed, only man’s skill at sophistry and misunderstanding nature, accidental or not. I have always found it curious how some of the most vocal and public skeptics are simultaneously the most staunch defenders of the single underlying postulate which creates the alarm in the first place, in the form of the atmospheric radiative greenhouse effect. The curiosity arises even more with the ongoing failure of the models predicated on that radiative postulate. Whether this indicates accessory to fraud is a court case that would be very interesting to see, and Fourier & de Saussure’s observations would play a central role in demonstrating the initial fact that no radiative greenhouse effect in fact exists. Whether certain players have gone on to purposefully lie about those results, or if they will admit their own incompetence on the subject, would be very revealing indeed. 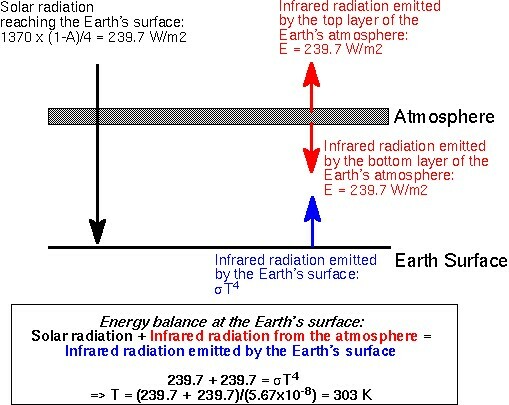 Note that there is no mention of a radiative greenhouse effect mechanics in situations where they should certainly apply according to the diagram above and its radiative scheme(ing). So note here how Mr. Monckton is apparently afraid of the “Thermageddon cult” accusing someone of not believing in the greenhouse effect. But why, what would be wrong with that? As scientists, as skeptics, we do not support the radiative greenhouse effect for the reasons stated in my previous reply and various places & reasons elsewhere. I am a respectable scientist and this is my respectable position which I can defend theoretically and demonstrate empirically at any time, as can any other “Slayer”. There is no necessary a-priori to believe in the radiative greenhouse effect. It is not an insult that the “Thermageddon cult” would point out that some skeptics do not support their radiative greenhouse effect which they require at the originating level to support their “Thermageddon cult”. To staunchly defend the basis of said “Thermageddon cult” is thus to defend that cult, and is what makes this duplicitous position among some very vocal and public “skeptics” so otherwise curious. It doesn’t help the “Thermageddon cult” if they point out that some scientists do not support their radiative greenhouse effect and that said scientists can even debunk it entirely – this directly harms them, obviously. It does directly defend them however when such a basic scientific thing to do as to question a demonstrably failed model and its basis postulate which they require for their policies is turned into a point of ridicule. You are neither scientists nor skeptics but crooks. The matter now passes to the District Attorney and to the IRS. The particular matter of concern is not so much the pseudo-scientific nonsense you are paid to peddle in the hope of discrediting climate skepticism, but your falsely claiming the support of scientists who have not in fact lent you support as you say they have done. You and Mr O’Sullivan – who is one of the nastiest pieces of work I have come across – have made an enormous mistake in trying to pretend that Fred Singer in any way supports your nonsense. He doesn’t, and has just sent me a further email to confirm that that is the case – not that any such email was necessary. Your attempts to blacken his name will now lead to an official investigation of your fraudulent methods, of your funding, and of your tax arrangements. In the meantime, you will do well to remove me from all of your ghastly mailings. Anything further that you send me will be included in the file for the DA and the police. We have all had enough of your nonsense and your lies about decent scientists such as Professor Singer, who is justifiably disappointed at your self-serving, dishonest, and malevolent misrepresentations of his scientific position on the climate question. Don’t you dare blacken his name again. Dear All. As the issue is Willie being in troubles for skepticism about cathastropic agw, it does not help too much the present discussion about the zero or the negligible effect that co2 may have. May I suggest the proponents of zero effect and negligible effect to respect each other and focus on the issue, again Willie being in troubles? The idea of a common letter to the Smithsonian’s is OK to me and should be OK almost to any one believing the scientific debate. The text may certainly be corrected to remove the reference to a negligible agw if this is not well accepted by all of us. There is absolutely no reason to push forward divisions these days. Are we supporting free debate on agw or not? I support such debate, indeed, particularly when it doesn’t protect or shield from debate certain fundamentals which are most necessary to debate given that those fundamentals have demonstrably failed via the climate models. Singer and others are of course well and welcome to begin questioning the fundamentals, and the Slayers particularly welcome it, as that was the gist of earlier comments. Mr Postma, like his conspirator Mr O’Sullivan, is again disingenuous. This email thread is being copied to the District Attorney, with a complaint from several of us, including scientists in addition to Dr Singer whose support this corrupt organization has attempted falsely to claim for its mad notions. A copy also goes to the IRS with a request for an investigation. Enough is enough. This is where the lies and evasions and circumlocutions stop. The further email from Professor Singer making it quite plain that this poisonous gang of crooks is misrepresenting his opinions makes matter plain, and his permission to forward his emails on the subject to the investigating and prosecuting authorities is being sought. You have been given more than enough more than plain warnings. That’s an awful lot of upset, anger, and ad-hom, all quite apparently directed towards protecting the “Thermageddon Cult’s” radiative greenhouse effect from critical analysis, conveniently using various red-herrings, side-issues, and unfounded legal charges as cover. Again, it is so curious how some “skeptics” protect and disallow criticism of the greenhouse effect, the greenhouse effect which is the very basis of climate alarm, and which is entirely criticisable for its logical and physical flaws and violations of the laws of thermodynamics. It is, as I said, duplicitous, and indicates possible compromise of either competency or honesty. By the way, there is no P&C anywhere on this email chain, and so you are quite welcome to submit my comments to whomever you like – I can defend and explain them at moment’s notice. Likewise, I shall be using your comments, Chris, from this email thread, for my own purposes including public exposure on my blog. Now I don’t know what actually motivates people to censor scientific discussions, and so I merely present that as a possible explanation. Of course, the Slayers and I have been accused of being such actors as well, the reasoning going that it is “so ridiculous” to question the radiative greenhouse effect that to do so makes skeptics look like fools and undermines the climate skeptic movement. Well, the alarmists would certainly take that position, and they take the general position that to be skeptical of climate alarm at all is foolish. That is, being skeptical of climate alarm is foolish, but being skeptical of the radiative greenhouse effect is the most foolish thing of all. Mainstream climate alarm skeptics then seem able to take the position of being skeptical of climate alarm, and nominally support climate change just not in an alarming manner, but are unable to withstand being called “utter fools” by the climate alarmists and therefore stand firm with the climate alarmists that the basis of climate alarm, their radiative greenhouse effect, is true. They do that even though their own research and findings have found that there is no evidence of a radiative greenhouse effect in operation. And so, it seems that what is actually being protected here is not climate alarm, but its underlying faulty basis, the radiative greenhouse effect. Let me repeat: What is actually being protected is the radiative greenhouse effect, not climate alarm. The Slayers and PSI however have taken the rational position that if one desires to criticize a theory, then one must examine the theory’s fundamental components. In the case of climate alarm, there is actually only a single fundamental component and that component is the radiative greenhouse effect. If the climate alarmist models have failed, and they have, then the sole rational thing to do is to reexamine those models, how they were created, how they work, and what they’re about, etc. I mean it’s empiricism, right? And doing any of that leads you squarely into the radiative greenhouse effect and how that concept is developed, and whether or not it is valid. We have found that it is not valid on basic theoretical grounds a-priori by violating such basic principles as the concept of heat, and the failed models also demonstrate that empirically after the fact. Why is it so important that everyone “believe” in the radiative greenhouse effect? Why is this an a-priori? Why is this something that can not be questioned or thought about? What other purposes could that mental boundary condition be serving? It seems to be something all about how light gets trapped on planet Earth before it can escape. Something about how light has to struggle to escape again, and can only do so by raising its frequency (its spectral temperature). Well, even if that is true in Gnostic theological terms (equating “light” with “soul”)…it is not true in physical terms with the radiative greenhouse effect, and so in this case, the below is not like the above. Or, the Gnostic theology is lying to you. It is of course obvious why the radiative greenhouse effect mental boundary condition is attractive to Gnostic theology, being a substantially direct analogy. Carbon credits (carbon sins) obviously provide a bridge over to Abrahamism, while also following the Gnostic theology of the sin of our souls’ being trapped in carbon-life-form-based matter…with carbon having the frequency wavenumber 66,666.6666¨!? Mr O’Sullivan is, of course, right. A radiative greenhouse effect doesn’t exist. Monckton of Brenchley confirmed he knew he is wrong by all the – over the top – threats. Joe, it amazes me why a scientist of such stature of Fred Singer needs a Monckton to defend him. Cannot he speak for himself? Is his scientific standing not far greater? I would think that a kindly worded letter directly to Mr Singer asking his position on the subject would be in order, a letter that does not claim he’s converted to the Slayer position, but that the statement you quoted suggests strong alignment with the invalidity of the GHE, so a private, unpreconditioned and unrefereed, i.e. true scientific one-to-one discussion should follow to examine the details. Joe – how do you and John find the free time from breaking rocks and time in solitary confinement to post these articles and websites ? Obviously, Monckton, the distinguished Lord, would have no trouble in having government minions take up his agenda hence I assume you must both be in jail and therefore I am amazed at the laxity of modern prison systems ! On a serious note the “science” in the Washington University IS taught as the back radiative greenhouse effect. What I find interesting is how they defend the absolute “truth” in the diagram – that atmospheric back radiation has equal heating power to sunlight ? How can they really defend this when it is so easy to disprove with a magnifying glass or metal parabolic mirror ? Solar ovens seem to fail to work when their mirrors are pointed away from the sun. Well done Joe. No ad hominems, at least none gratuitously insulting. I agree with your science and your surprise that mainstream sceptics don’t acknowledge a legitimate viewpoint. Dr Singer accepts, as any rational scientist must, that the molecular vibration resulting from the excitation-deecitation collisions of CO2 molecules and near-infrared photons is heat. In optical physics this is well understood down to the quantum level and is not in doubt. Dr Singer does not question, and has never for an instant questioned, this long-demonstrated result. He does not support, and has never supported, those who pretend that -in effect- there is no such thing as heat. He does question, as do I, the magnitude of the warming effect of CO2, for reasons that have nothing whatsoever to do with the smear that he does not recognise that there is a greenhouse effect. For the same reason, Mr Postma’s attempts to brand me as a fellow unbeliever in science are characteristically apfalse and mendacious and are not to be taken seriously. While the slayers PR and communication skills may not have always been the best, their science is impeccable. The radiative greenhouse theory is on of the biggest blunders ever made in science. It ranks ahead of “Freon will destroy all life on the planet”. @roald – Because he doesn’t want the greenhouse effect to be criticized, and wants to protect it. Yes, i just don’t get why. He is stuck in his calculations unable, or unwilling to consider the whole “thing”. Very strange! I have posted a commented on a couple of later threads that Christopher Monkton is now using a simple electrical circuit diagram to claim the backradiation position and his accuracy in quantifying it to his lukewarmer position. His paper will thus be the sole saviour of humanity from the forces of darkness and the prestige that goes with it. I hope you will address it directly.